Welcome the second day 12 days of Anime. One of my anime goals for this year was to read 50 manga, which I sadly didn’t managed to complete, manga reading has been so slow. I have managed to read about 20 manga’s which is not much but of what I read I have picked three that were favorites reads for this. 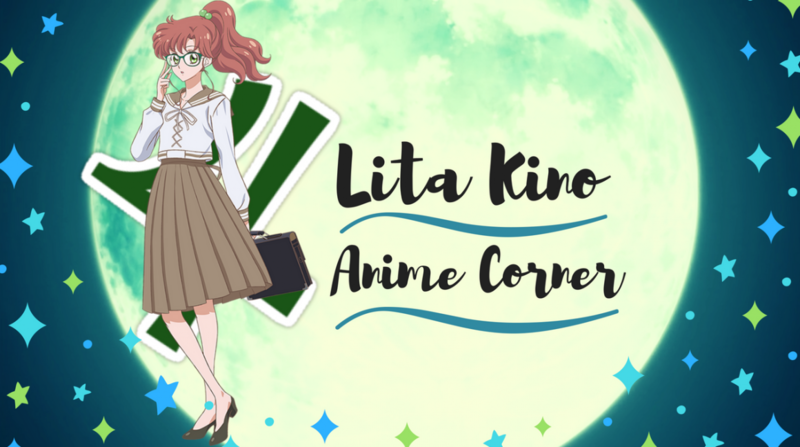 My number one favorite I loved binge reading was Blue Spring Ride. I liked the anime but it left off of me wanting more of Kou and Futuba. Futuba had a crush in middle school Tanaka but he transferred schools. Years later the two meet again Tanaka goes by Kou now and is a completely different person than what Futuba remembers. It’s one of the better romance/school manga I’ve read in a while, the pacing of Futuba and Kou rekindling relationship was good. Towards the end the manga took a different love interest direction from memory that really tore me in two. Futuba is a character I would describe as hard to not like in someway. Her desperate attempt to be something she wasn’t and blend in with the crowd, the fear of being a loner. Futuba’s realization the only way to go is to be yourself and after she builds into a strong protagonist. 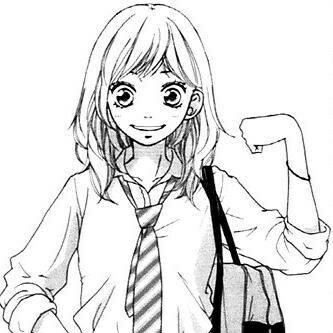 She was a great representation of this, I enjoyed her character growth in the manga more than the anime. She had this grasping power about her bringing out the hidden feelings Kou kept away, she was persistent but in a good way not that Kou was willing to admit. Every new endeavor Futuba came towards her facial expression whether happy, sad is adorable to look at. I remember comparing from the anime and manga, memory from middle school Futuba comes running towards Kou with that amazing expression. That is a my favorite scene from this series, it gives off a comforting feeling as what Futuba was thinking in that moment, feeling happy, it’s a pretty expression. Futuba is a very likable protagonist, willingness to try, be there for those she cares and all round caring individual. Kou’s character never gripped me in the beginning because of his coldness towards Futuba in either manga or anime. Reading up to where the anime left off where he finally lets out all the bottled up feelings he had been holding in, is where I began to start like Kou’s character. I may think he is a selfish brat but Futuba’s influence softens that coldness and brings out Kou’s warm side. These typical male protagonist you get in shoujo titles, the cold jerks first time I can say I could see myself liking Kou despite of how he is. I’ve never felt that about any male shoujo protagonist but Kou had this hidden cute factor somewhere so a win here haha. I liked Kou’s character growth, learning to lean on others and be more accepting to let people into his heart. Both Kou and Futuba I noticed both had one thing in common they both needed to learn to let people into their life. There’s just something about these two and their relationship that is enjoyable to watch grow both in the anime and manga. Massive strain I talked about before sent the manga in a different direction and actually was worried if these two would ever admit their feelings. Should mention I just keep talking about these two I loved the other characters in the series. The group of friends Kou and Futuba make have their own individual situations going on in the manga, but there is a good separation pacing from the main couple. So your attention is not undivided as a whole circle of friends, there’s sweet friendship moments between everyone, cute group. Manga art work is crisp and bold something I know I could look at all the time, all the characters look handsome I mean all. Some people have said some of the love triangle drama towards the end is unnecessary and drags out the story too much, it does a little but it gives you the tugging feels experience. All us shoujo fans love, and I would recommend to anyone who’s not a big romance fan, would enjoy this tamed romance. Maybe I will do better on manga reading starting next year. Blue Spring Ride was a great read and would re – read for certain, but waiting for that second season to be announced you know. I’ll see you on Day 3 12 days of anime ! Blue Spring Ride was amazing!! I wish the anime series had continued! 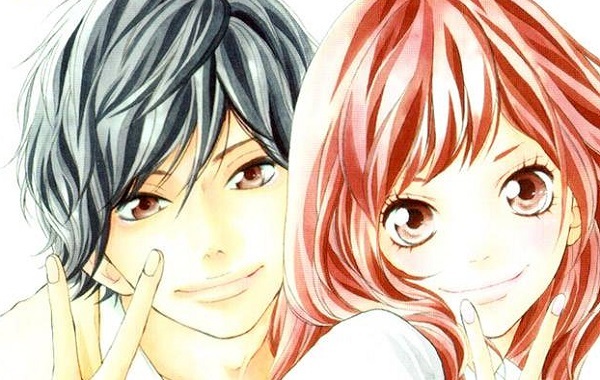 However I think that Kou and Futaba look like kakeru and Naho from Orange. 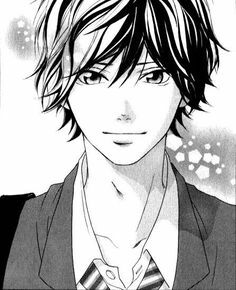 If you liked Ao Haru Ride you need to read Strobe Edge by the same mangaka, I haven’t read Ao Haru yet, but strobe edge is one if my faves so far 😻😻 at first you might not like Ninako because she’s a bit immature, but she really grows, and Ren will make you cry for sure aaah. You’ll like Ren for sure, he isn’t cold or a douche! Omg you have?! LITA WHERE, HOW DID I NOT FIND IT?? ?